W e just left the UK Inglourious Basterds premiere. It was the first proper screening outside of it's Cannes debut. We really enjoyed it! It's a zany 70s style blood fest. It shows a more mature Tarantino - the guy is deep and there are so many references to the almost lost art of film it' s beautiful BUT he offers a bag of tricks for everyone! The Basterds soon cross paths with a French-Jewish teenage girl who runs a cinema in Paris which is targeted by the soldiers. 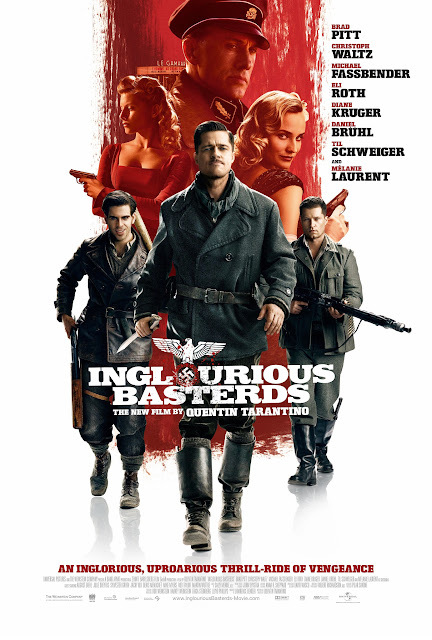 We had no confirmation of who would be attending but we are hoping that the man himself Quentin Tarantino would be there and bring along the stars of Inglourious Basterds including; Brad Pitt, Mélanie Laurent, Christoph Waltz, Diane Kruger, Eli Roth, of course Michael Fassbender and maybe Mike Myers (yes, he of the Austin Powers and Shrek movies). Sadly not all the cast attended but Diane Kruger and Christoph Waltz joined Quentin Tarantino on stage to rouse the audience and introduce the Inglourious Basterds! Tarantino sat 5 seats away from us in the audience, watching his film literally on the edge of his seat gauging audience reaction. The sweetest thing happened - after the film started Tarantino walked around almost unrecognised like an anticipatory father checking the audio output from different areas in the cinema. As the credits rolled we got to congratulate and chat with the legend himself. He truly is the film geeks geek!